The L.A. 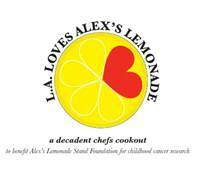 Loves Alex’s Lemonade Culinary Cookout, hosted by Chef Suzanne Goin, partner Caroline Styne (Lucques, A.O.C., Tavern) along with Chef David Lentz (The Hungry Cat), returns to Culver Studios on Saturday, September 29, 2012 from 12 – 4pm for its third highly anticipated season. Neil Patrick Harris and his partner, E! News Correspondent David Burtka, will return as Honorary Co-Hosts and Jimmy Kimmel, an outstanding champion of this fundraiser and member of Alex’s Lemonade Stand Foundation’s National Advisory Board, will reprise his role as Master of Ceremonies with Viveca Paulin Ferrell acting as celebrity auctioneer. The Presenting Sponsor for the culinary cookout will be Volvo Cars of North America. Goin, Styne and Lentz have again enlisted the support and generosity of their culinary friends around the nation who will donate their time and services to raise funds and awareness for Alex’s Lemonade Stand Foundation (ALSF) in their quest to find better treatments and cures for all kids with cancer. The 3rd Annual L.A. Loves Alex’s Lemonade invites food and wine lovers from all corners of the globe for an afternoon of fantastic fare, cocktails for a cause, children’s activities, silent and live auctions, and much more. The 2012 event is shaping up to surpass the aspirations of previous years, with returning chefs Giada De Laurentiis, Paul Kahan, April Bloomfield, Chris Bianco, Marc Vetri, Jonathan Waxman, and new participating chefs Cat Cora, Matt Accarino, Katrina Markoff, Nancy Oakes, Michael Schwartz, Mary Sue Milliken, Michael Voltaggio, Steve Samson, Zack Pollack and Rocco Whalen, coming together to cook for childhood cancer cures (for a complete list, see below). Guests will also experience the cocktail artistry of major mixologists, including Eric Alperin (The Varnish), Neal Bodenheimer (Cure), Tim Staehling (The Hungry Cat), Greg Lindgren (Rye on the Road), Chris Ojeda (Soho House) and Christiaan Rolich (Lucques) who will craft signature drinks for attendees. In addition to General Admission tickets of $175, L.A. Loves Alex’s Lemonade will offer a $1,200 premier ticket level including early admission, reserved seating and an exclusive Meet-And-Greet dinner the night before the event prepared by Nancy Silverton and special friends, where guests can meet the participating chefs. Added for this year, special seating at reserved tables of 10 will be sold for $5,000 each, which includes entry and personal table service. Children are welcome to accompany their parents to the Sunday festivities and those under 10 receive complimentary admission. Tickets for all levels are available for purchase online at www.lucques.com, www.thehungrycat.com or AlexsLemonade.org/campaign/la-loves-alexs-lemonade. All proceeds will benefit ALSF. Galvanized by their experience at The Great Chefs Event benefiting Alex’s Lemonade Stand Foundation in Philadelphia, Goin, Styne and Lentz felt ready to partner with their east coast friends and lead the way for a Los Angeles-designed event to broaden the reach of Alex’s Lemonade Stand’s fundraising efforts. L.A. supporters enthusiastically responded with huge turnouts in 2010 and 2011, sampling signature dishes of more than 35 renowned chefs and reaching over $650,000 in ticket and auction sales in just two years. Two auction lots – The Great Women Chefs Dinner featuring Giada De Laurentiis, Suzanne Goin, Nancy Silverton, Alice Waters, Sherry Yard and Vintner Ann Colgin, and The Great Men Chefs Dinner with Paul Kahan, Jonathan Waxman, Michael Tusk, Josiah Citrin, Matt Molina, & Michael Cimarusti, contributed $101,000 of over $170,000 in live bidding in 2011. Goin, Styne and Lentz are already developing stunning dining and experience packages for the fall 2012 event. Alex’s Lemonade Stand Foundation (ALSF) emerged from the front yard lemonade stand of cancer patient Alexandra “Alex” Scott (1996-2004). In 2000, 4-year-old Alex announced that she wanted to hold a lemonade stand to raise money to help find a cure for all children with cancer. Since Alex held that first stand, the Foundation bearing her name has evolved into a national fundraising movement, complete with thousands of volunteers across the country carrying on her legacy of hope. To date, Alex’s Lemonade Stand Foundation, a registered 501(c)3 charity, has raised more than $55 million toward fulfilling Alex’s dream of finding a cure, funding over 250 pediatric cancer research projects nationally.